Note: Now to use Google Maps API we must have API Key which needs to be added in API URL above. See How to GET API Key? centerCords: will lat Lattitude & Longitude object to show the center of the map on load. InforObj: will have InfoWindow object that will be used to close other info’s on click or hover. 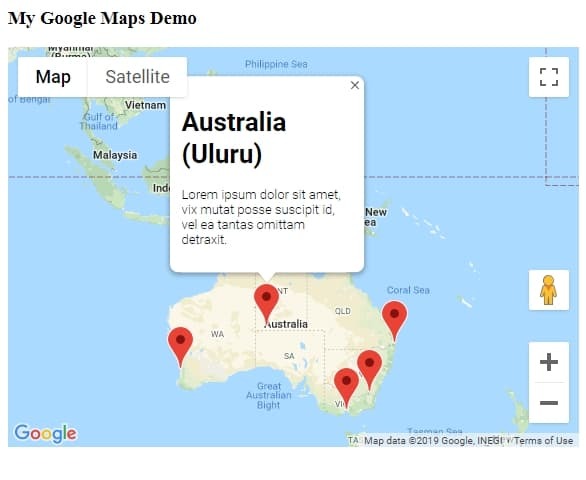 markersOnMap: Data object having Lat Long and InfoWindow content in HTML. closeOtherInfo() : Keeps track of clicked infoWindow then close others to keep only one open at a time. Currently, we have Click even to open InfoWindow popup but there is also commented code to show on Hover.